Well, while as far as I know, no legal documents exist stating that Jesus, son of Mary and Joseph, was born on December 25, 0 A.D., there is literary evidence that Jesus was born in Bethlehem in Judea. Read the Gospels of St. Luke and St. Matthew. And I guess you are either going to believe their writings or you’re going to assume they were big fat liars. Many historical scholars take their writings seriously. And I believe. As all good story tellers, the writers tweaked the story a bit. I’m pretty sure the shepherds didn’t come that same night, nor did the three kings come a couple of weeks later. But I believe the Son of God was born to Mary in Bethlehem, and I’m sure he had humble beginnings, perhaps born in a stable. It is true that Mary and Joseph needed to go to Bethlehem to register, and it’s likely that there wouldn’t be a lot of places to stay, especially if you are a poor carpenter. Anyway, I’m no biblical scholar, just a believing Christian. 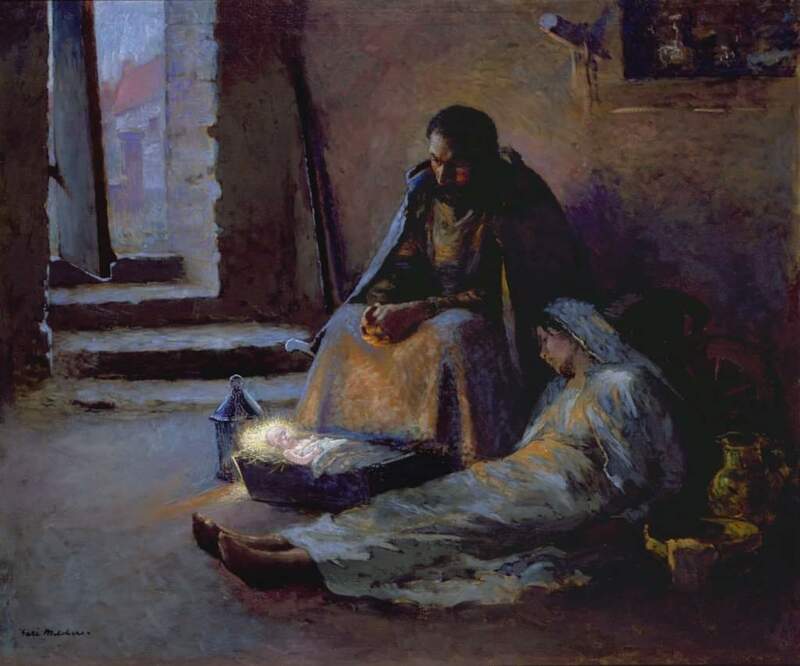 All that aside, every year around this time, I begin thinking about Mary, a poor Jewish girl not much older than my eldest granddaughter, going out to gather water or do some chore or another and suddenly being greeted by an angel with the astounding news that she was chosen to be the mother of the Son of God. She was going to bear a child even though she hadn’t been with a man. Think about that. Think about small towns anywhere. The inevitable gossip would never end, no matter that Joseph agreed to marry her. Think about the fact that her child would never really belong to her. I don’t know if she knew about his inevitable end and I doubt she even came close to understanding what taking on this commitment would entail. Nevertheless, she had to be terrified. And yet, she said yes. Neither Luke nor Matthew mention a word about Mary saying, “Give me just a minute, I need to think about this.” But I bet she did. Who wouldn’t? In the end, Mary made the ultimate sacrifice and basically gave up her life so that Jesus could fulfill the words of the prophets. It’s interesting to think how things would be different had she said no. This past week, I came across these two beautiful nativity prints on Facebook. Gari Melchers is the artist for the first painting. Unfortunately, I don’t know the artist of the second. Every depiction I’ve ever seen about the nativity shows Mary and Joseph kneeling over the manger worshiping the Baby Jesus. 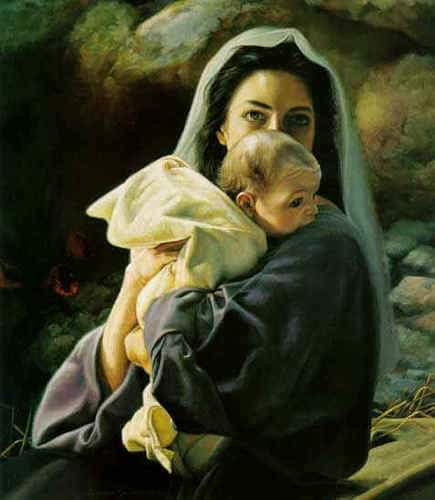 Anyone who has given birth knows how absolutely exhausted Mary would have been, and how terrified Joseph would feel. Doesn’t this depiction of Mary and Joseph right after she gives birth look more accurate? Mary looks totally spent and Joseph looks absolutely stunned and terrified…..
And words can’t express how much I love this depiction of Mary and Jesus…..
Sunday’s gospel really got me thinking about Mary too. Which led me to the Magnificat and this week when I’ve been praying to God I’m reciting the Hail of Mary with extra devotion. Love those pictures. I wish I knew the artist so I could attribute them…. Its funny how we don’t think about Mary and Joseph being “real” people. But they were. The “Mary Did You Know” song is one of my favorites. It reminds me of the magnitude of what she was asked to do and it touches my mothers heart. How could she comprehend everything that was going to happen? But we are forever grateful that she said YES. I really enjoyed the pictures. My sister asked recently what my two favorite Christmas carols were. I said Silver Bells was my favorite secular carol because we always sung that together as we were growing up. And my favorite religious carol always had been Joy to the World, but recently changed to Mary Did You Know. It makes me cry every time I hear it. I love Jordan Smith’s version, as well as the Pentatonix version. Trisha Yearwood sings a song called It Wasn’t His Child that is also amazing. Beautiful post Kris, you don’t have to be a scholar to know what Mary did. How many of us today would be willing to accept the responsibility of accepting this. At first I did no like the song, “Mary did you know”, but after listening and then realizing what SHE had to face was not an easy task for anyone much less a mother. I shared the first picture and if I can I will check to see who the artist is. Merry Christmas to Bill and you!! Merry Christmas to you as well. If you find out the artist, let me know! So lovely, Kris — both the photos and your faith (they both made me cry). Thank you for sharing and being a Witness to your friend and all those who read this. And the Gift of Christmas continues!